REVIEWS: "PATSY CLINE: THE NEW RECORDINGS"
When one hears 'new music set to Patsy Cline songs' our first reaction is "you just don't do that. You don't." But that isn't entirely what this is. It's more a "beautiful addition" to what is already there. I discovered Patsy Cline when I was 10 (which was some time ago now) and have her entire collection, including the more obscure tracks. So I'm a major skeptic about any tampering with her masterpieces. But this CD was done with extraordinarily good taste and respect for the originals. Real musicians. A great example is South of the Border. It has a more Latin sound now (as it should), but not exaggerated. This CD is like going to see a Pasty Cline concert with a full orchestra. Aside from violins, there are saxophones as well as guitar where it's needed. Cline's vocals are not at all changed nor drowned out. She herself would love this. That I am sure of. And you will too. This is highly recommended. Recordings in this album are rare gems! This is the biggest treat for Patsy fans in many years! Imagine NEW PERFORMANCES we haven't heard before! Amazing! And the redone studio tracks sparkle like diamonds. They are so clear.....Patsy's wonderful voice never sounded more pure and wonderful. In the liner notes a man who knew her when she was growing up tells anecdotes about her and remarks on how he used to watch her practice her singing in front of a mirror! He later owned a club where she performed and he attests that "Patsy Cline: The New Recordings" is THE BEST, most natural sounding and closest to the way he remembers Patsy sounding in real life. What better testimonial could there be than that? The Best Patsy Cline CD Available! 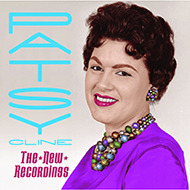 This is the best Patsy Cline CD I have listened to since "The Divine Ms. Cline", by the same producers. They have removed all the annoying nuisances that were plaguing the original tracks. You won't get quality like this anywhere else, especially when played on a high end stereo system. I noticed that one user mentioned that these same tracks are available on youtube, this is simply not true. When a file is uploaded on YouTube much of the audio quality is lost, due to compression. These tracks also have superb new Instrumentation which breathes new life into these recordings. If you are a fan of Patsy, this is simply a must-have album. Anyway, you will not be sorry in purchasing this 'A New Way' or the 2 released previously on the same great indie label! Nice job of adding different instrumentation to the Decca/4 Star material. Some of my favorites were used such as Your Stronger than me. The Nashville recordings or Opry recordings sound great. Love they used introductions, you even hear Patsy talked a little bit. The demos sound great. They cleaned up wonderfully. I'm in love with this! This is a beautiful set of songs enhanced with whole new sets of strings and the like. Myself, owning such a large Patsy library, now feel as if I own her completely. This CD is exactly what has been missing for the past 50 years. Save your money on buying Patsy's latest box set (way over priced) and lay your money down on this beauty. You'll be glad you did! This Patsy Cline CD has NINE songs that are previously unreleased. NINE you can't buy on any other CD. That alone ought to make it a huge collector's item. One, of the many, stand-out tracks is "Tennessee Waltz" a song that Patsy Cline never made a studio version of. This is a live version augmented with an up-to-the-minute musical backing...this is worth the price of the CD alone. A priceless gem! I purchased this CD about 3 weeks ago. This makes 27 various Patsy Cline cds I now have, as I have loved her music for over 40 years. I will say in all honesty, that this is a treasure. Her timeless voice now rings out again in crystal-clear ways like never before, with the exception of The Divine Miss Cline. The overdubs are above reproach. I dare say that any generation, from millenials to baby boomers, will take joy in listening to these new recordings from a true music legend. Rare, rare and extra rare! In thinking about the sad loss of Miss Patsy around this time, it is gratifying to know that her magnificent, one-of-a-kind voice is still with us, thanks to the magic of technology she will never die. These recently redone recordings bring Patsy up to date so her voice sounds as current as if she was alive recording today. It's a beautiful experience, almost spiritual, to listen to her sounding so good and at the peak of her vocal powers, set amidst some very tastefully done new musical arrangements that compliment her performances so well. Bravo!